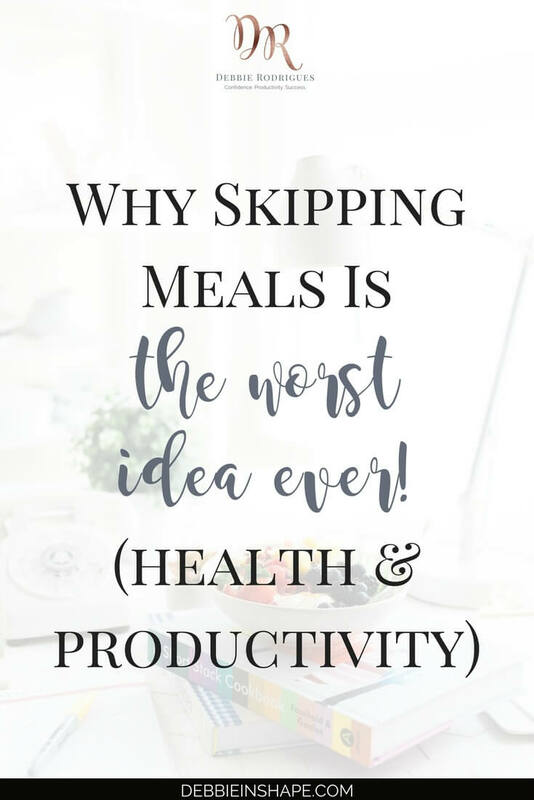 Skipping meals is the worst idea ever for your productivity and health. Find out why you must quit it right now. When you get up late to work or to take the kids to school, what’s the first thought you have? That not assuming you are one of those who doesn’t even make time for breakfast ever! I know exactly how it goes because I’ve been there, done that. When I was in a cycle of going to bed late and not sleeping enough, I decided I could get some extra snooze by not having breakfast at home. I set my loud (and noisy) alarm clock for just enough time to get dressed and go to the train station. Depending on the delays of public transportation (after the train, I also took the subway and a bus), at some point in the morning, I’d grab a cup of coffee and a croissant at work. I repeated that routine day, after day, after day. Besides, when things used to get tough during the day, I just grabbed “whatever” for lunch, and I ate at my desk. This bad habit persisted with me even when I changed jobs and company. Was it for the fame and glory of arriving with a grumpy face at the office and annoy my colleagues with the smell of my food? Back then, I had the illusion I was more productive because of my skipped meals. Yep, the illusion! Because I couldn’t be more wrong! I hope you clicked on the links I added in the section above. They take you to previous blog posts of the 52-Week Challenge For A More Productive You. When you compare those posts with my old routine, you see that my habits, in general, were far from efficient. Planning and organization were in my blood. I used to check everything I needed the day before and get all stationary needed and correspondence before going to my desk. I was still sabotaging my productivity. “How is it possible?” You might ask. Mainly when you’re young, and you have enough energy to “handle” things, you just keep on doing it. Note that I was doing my work. I had just finished a successful internship after college at the company of my dreams, and I adored my job. You’d only see me depressed on Fridays evening when I had to leave the office for 2 entire days! When I look back, mainly after my brain tumor diagnosis and surgery years ago, I realize how I wasn’t smart. At that time, I could have done a lot more, in a more efficient matter, without feeling overwhelmed. I could have spared myself some overtime throughout the years. All it took was putting into practice the knowledge I already had and that I share with my clients and you nowadays. Since I previously wrote about how you can avoid some of my mishaps from the past. 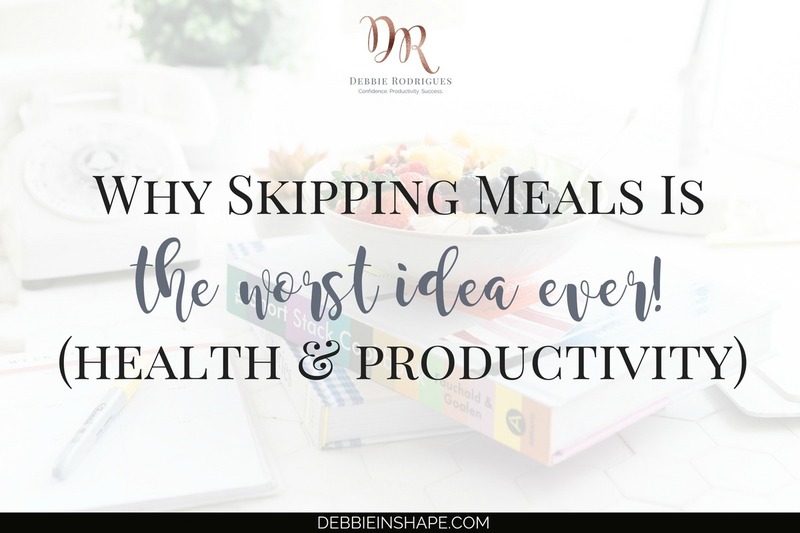 Let me lend you a hand with another not-so-obvious productivity killer from my list: skipping meals. 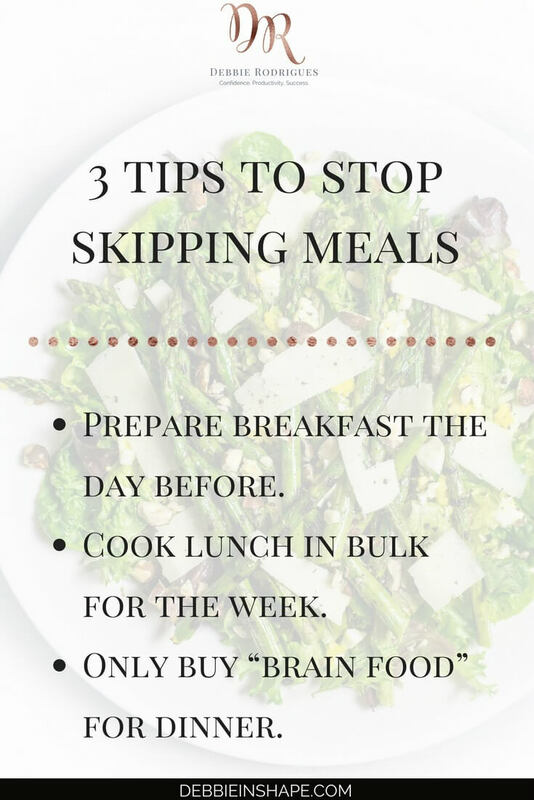 Depending on your food regimen, you may eat more meals, but I’ll stick with the most important ones and why skipping them isn’t a smart move. Doesn’t it look a lot like an inconvenient meal? You just got out of bed, with more or less difficulty, and yet you have to eat right away. While some of us cannot wait to grab some food, there are others whose stomach is upset early in the morning. So why not skipping breakfast? The problem with skipping breakfast is that it’s the most important meal of the day. Your body is depleted after hours sleeping and a lot of brain activity. Not only you want to give it some food, but hydration as well. One tip to find time for breakfast is preparing it the day before. Separate all the ingredients you’ll need in the evening, and it’ll save you tons of time. Skipping your midday break is another temptation. Sometimes you’re so caught up with a project that leaving your desk feels like the worst idea ever. However, skipping lunch is much worse! Eating away from your desk is, in fact, a great productivity booster. And if you opt for foods to help you focus better, your afternoon becomes even more productive. If you don’t have time to cook daily when working from home or if the queue at the cafeteria is too long to bother, cooking in advance is the solution for you. Cook in bulk over the weekend, and you’ll be in control of your intake without stressing out. From my experience, as a coach and an ex-meal-skipper, dinner is the hardest one to ignore. Mainly if you haven’t paid the deserved attention to all your previous meals, it’s impossible to fall asleep on an empty stomach. While you probably grab “something” on a regular basis, the quality of your dinner may be hurting your productivity the following day. Remember that your brain works while you’re asleep! That’s why you have to be aware of the importance of healthy food in our life. That TV dinner might be ready in just a couple of minutes, but it’s not exactly the best food for the brain. To avoid eating food that isn’t good for you, just don’t buy it. Yes, it is this simple! Instead of having unhealthy stuff in your cupboards and fridge, buy brain food, and your dinner is always going to be a safe meal. In the next weeks, I’ll be covering more specifics about “brain food” and how it influences your efficiency. Start by making time to eat so that you have energy and focus on performing your daily activities. Parents should also think about setting the example for their kids. Children don’t always listen to what say, but they’re still looking at what you do. And if you’re working for a promotion, make sure your boss doesn’t see you crawling to your desk every day. If you need some help to get started, join me on the 52-Week Challenge For A More Productive You. Learn how to stop skipping meals once and for all by creating space in your schedule for yourself. 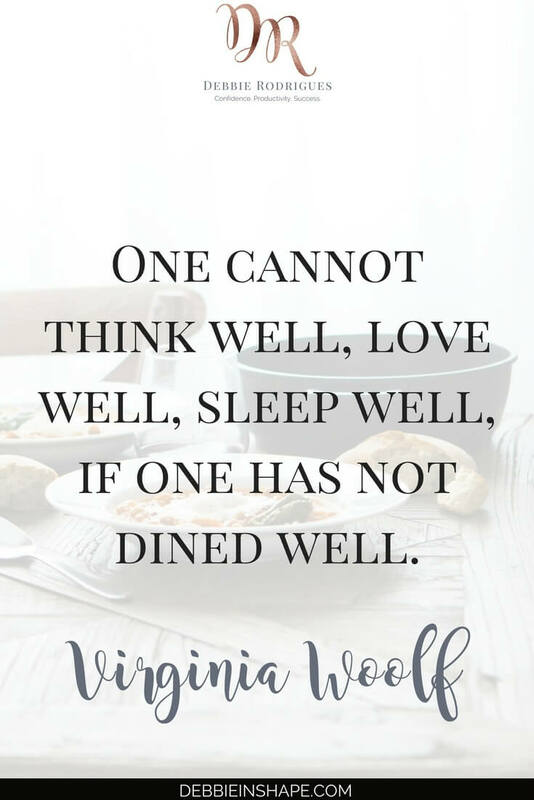 What meal(s) do you tend to skip? Why?